A team at the Technical University of Munich in Germany has designed a glass chip pierced with micro-sized tubes that act the same way as spider silk glands, and can be used to replicate the initial stages of natural silk production. It's an interesting development since production of artificial spider silk has proven difficult in industrial quantities and qualities, and its tensile strength to density ratio is five times that of steel, making it potentially very useful as armor and in medical applications. 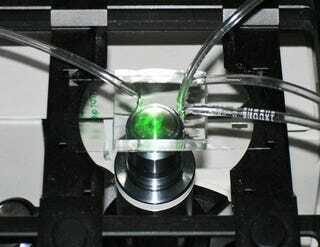 The device works by mixing two different artificial spider silk proteins and a phosphate salt, then squirting them out of the artificial glass spinneret. This produces long protein chains that form the artificial silk. It's the first device that accurately copies the chemistry and physical processes that are found in nature, as well as being the first to mix two silk proteins (specifically, ADF3 and ADF4 from the European garden spider). For the time being the quality doesn't yet match real silk, since it appears too grainy. "The major breakthrough is that this is the first time one has produced fully synthetic silk threads and understood why," says team-leader Professor Bausch. The team believes that when they copy the drying and drawing-out stages real spiders use then its quality will be up to scratch. They're working to perfect the synthetic silk machine, but cannot reveal how as they're in the middle of patent applications.